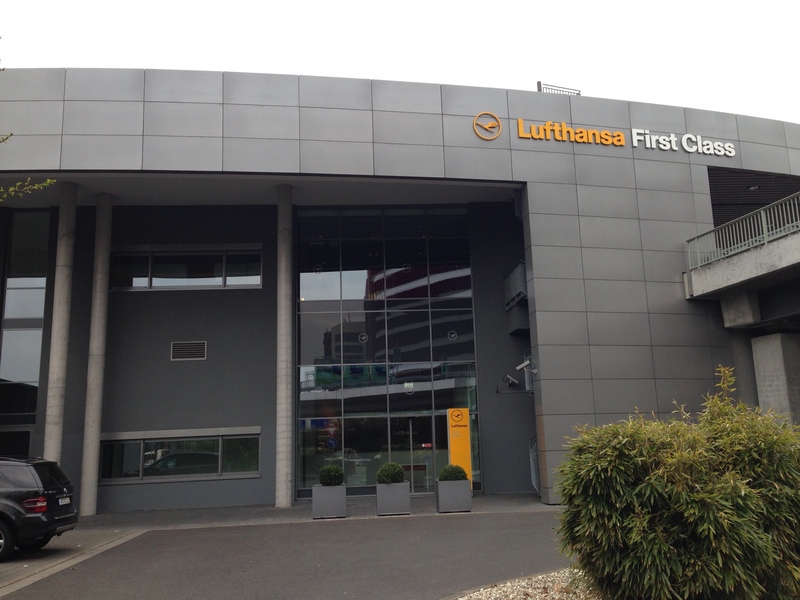 Why You Must Fly Lufthansa First Class! I flew Lufthansa First Class on their the Munich to San Francisco flight a few weeks ago, and it was one of the best flights I’ve ever taken. It seems almost like Lufthansa has upped their product even more after United made it harder for Americans to freeload to redeem for First Class. For this flight, I used my Aeroplan miles which I earned from the American Express Platinum Card, offering 60,000 points as a signup bonus. Lufthansa first class is also one of the easiest first class products to access, since it costs just 62,500 Aeroplan miles to fly from Europe Zone 1 to North America one-way. You can the points easily get through signing for just two credit cards. The American Express Business Gold Rewards Card offers 40,000 Membership Rewards points after completing minimum spend, transferring to 40,000 Aeroplan points. 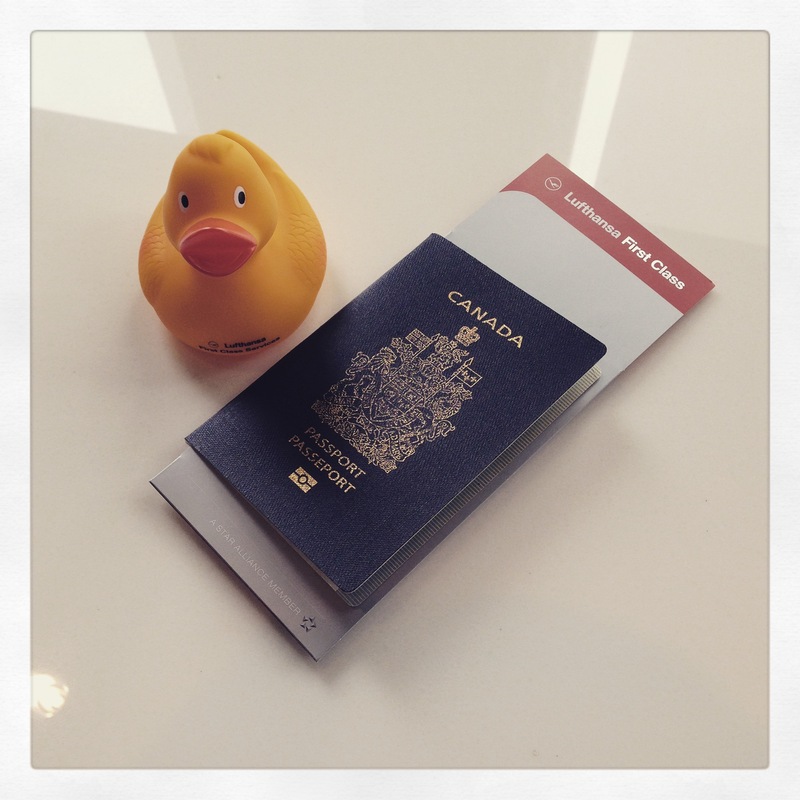 To get the remainder, the TD Aeroplan Visa Infinite offers 25,000 Aeroplan points after $1000 minimum spend. Both cards have annual fee waivers, so you’re not paying anything out of pocket. The ticket I booked was Copenhagen – Vienna – Frankfurt – Munich – San Francisco – Vancouver. 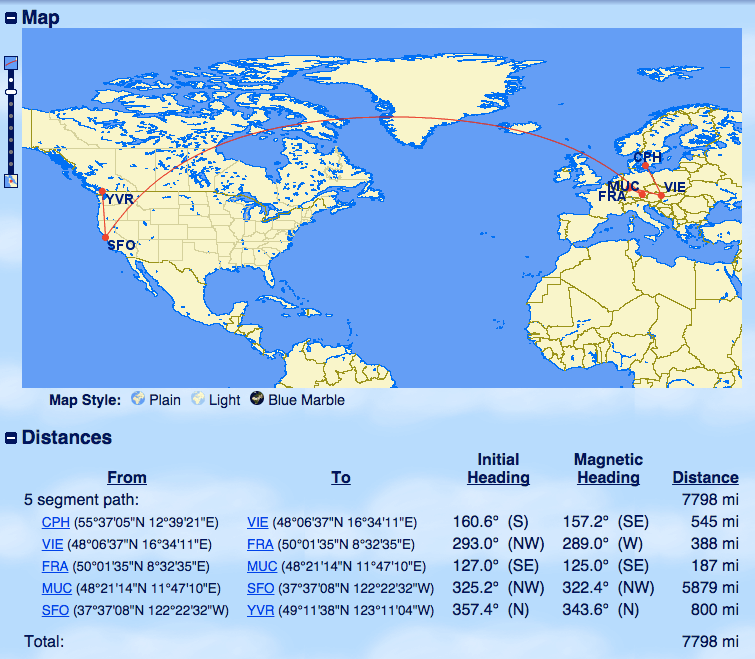 I specifically utilized this routing because it allowed me to depart from Scandinavia, reducing fuel surcharges. As well, I inserted a 23 hour layover in Vienna, allowing me to visit the First Class lounges in Frankfurt and Munich all in one ticket. The total price for my ticket was 62,500 miles and $356, with around $160 in fuel surcharges. Normally fuel surcharges on Lufthansa are $450+, but a great way to save a bit of money and visit Scandinavia is leveraging capped fuel surcharge regions. This trick is quite useful for an itinerary like this where fuel surcharges are quite heavy. If you want to offset the fuel surcharges, I could have redeemed miles from a flexible travel currency like points from the TD First Class Visa Infinite, Scotiabank Gold American Express, and BMO World Elite Mastercard. You could also use TripFlex to redeem your American Express points like those from the American Express Gold Card, but that is not the best use of AMEX miles, in my opinion. LUFTHANSA FIRST CLASS IS AWESOME!!! In Frankfurt, you have your own dedicated First Class Terminal. 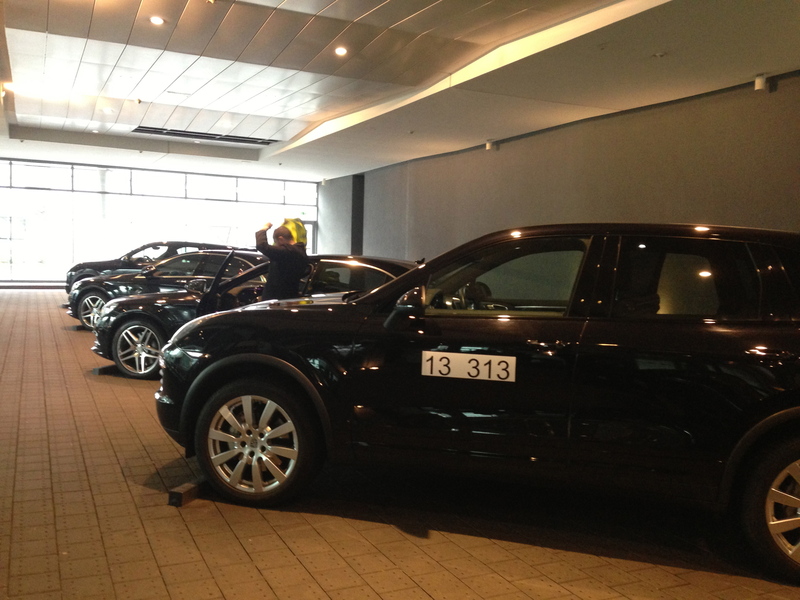 You’re escorted to the plane in a Mercedes or Porsche. There are planes where you get both a seat AND a bed. 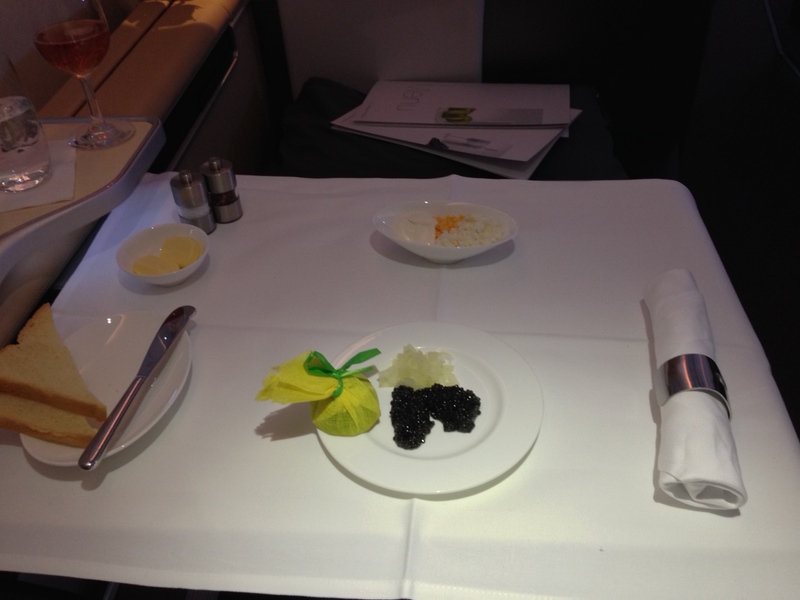 I really enjoy the caviar on board, the in-flight wifi, and the Rimowa Amenity kits. Service and food is hit or miss, but on average Lufthansa has one of the strongest all-around first class products. When the food and service is spot on, like it was on my Munich to San Francisco flight, it’s an amazing flight. 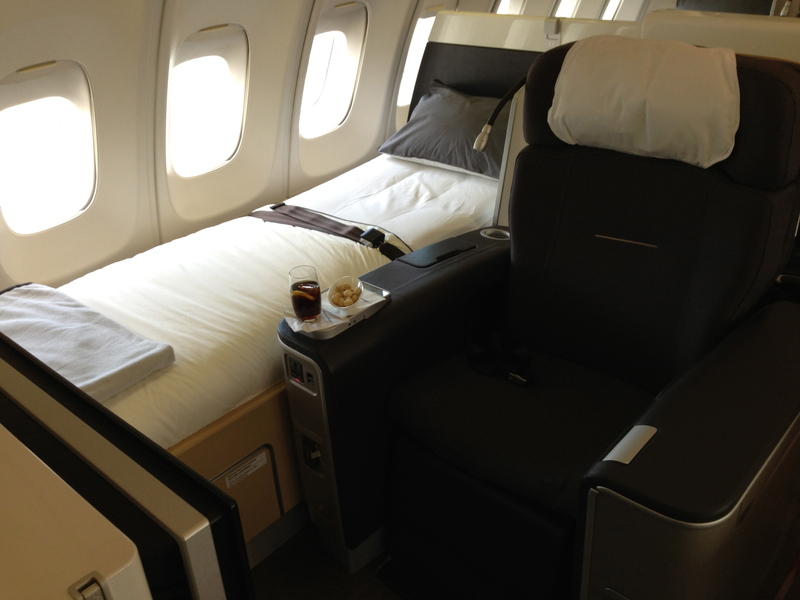 Lufthansa starts releasing first class awards to non Miles & More members starting 14 days from departure. I monitor the paid space availability on ExpertFlyer. This is a moderately accurate indicator of if Lufthansa First Class will release award space. All Lufthansa First Class flights have 8 cabin seats, so you can determine how many seats are sold from looking on Expertflyer, under their Flight Availability tab. There are certain routes where premium demand is heavy, and thus a flight with only two seats sold (showing F6 A6) may not necessarily release seats. The Los Angeles and San Francisco flights fall into this category, while Houston, Miami, and New York JFK sometimes are also tough to find availability on. Unfortunately, Lufthansa has cancelled First Class service on their Frankfurt to Vancouver and Toronto flights – the only LH F to Canada is on their Munich to Vancouver and Toronto flights. The easiest flights to snag award space on are probably to Boston and Mexico City. For example, the Munich to Boston flight on May 15th is showing as F8 A8, meaning there are no paid first class seats sold. There is award space on that flight. With some gateways like Chicago or Washington Dulles, award seats will be held back until around T-4 even though the flight shows F7 or F6 at the 10-14 day mark. To snag Lufthansa First Class awards, I’ll personally start looking at flights around 3-4 weeks before the departure date, and narrow in on flights where there are at least five first class seats for sale (F5 A5). Then I will check multiple times daily to see if an award seat turns up. 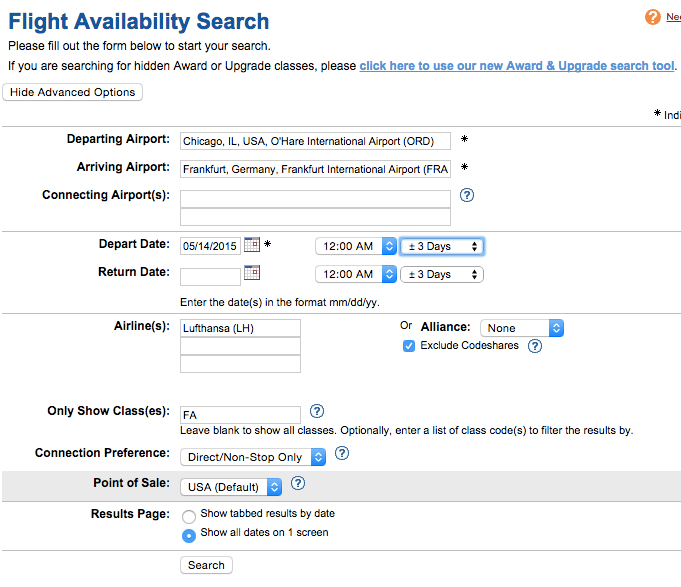 Two tools will automatically search award availability for you. I will usually set up an alert on those sites as well. I currently use Wandering Aramean’s Travel Tools (WATT). In addition to searching star alliance space, they also have great oneworld alerts. Award Nexus also does the same thing, but I don’t like it because you’re limited to the amount of searches you can perform and have to pay to top up. Have you ever flown Lufthansa First Class? Not everyone is able to make vacation plans on less than two week’s notice, you know. I hope you made sure to maximize your first class experience. You don’t have to book 14 days out, because you can lock in something and just swap to LH F at T-14. It doesn’t mean you have to make vacation plans 2 weeks out. Would you be able to book a flight using United miles from USA to Europe (so that you have a flight) and then change it to LH when space appears close in? I know there will be change fees and whatnot but might be worth it especially since you know you have a flight, a last minute change to LH for $100 would be great! Also, in that scenario, if you are flying J and want to change it to LH F would they just charge you the difference in miles in addition to the change fee? Yes you would be able to do that. They would charge you the additional difference in miles. Always wanted to travel on LH in first class! for aeroplan, one stop over is allowed? You’re allowed two stopovers or one stopover + open jaw on a roundtrip, and none on a one-way. it looks like wandering aramean’s star alliance tool is no longer active, after a case with United. I believe the ANA Tool alerts are still active. It’s just a little too short!